British gold coins have always been a great investment as they have a long history of coinage. These coins are an incredible asset to any numismatist and almost always appreciate in value over the years. Although many were issued over the years, they continue to remain a much-sought after category of coins across the world for both investors and collectors alike. In this article, we will explore ten of the best of British gold coins that have consistently delivered great value to buyers worldwide. The sovereign has a long history, having originally been issued by Henry VII in 1489. The sovereign issued in those years had a diameter of 42mm and weighed 15.55gms. It was initially known as the “double royal” but soon had its name changed to the sovereign. It is thought that at the time, it was too great in value to enjoy circulation, and was retained as a presentation piece for important delegates. The sovereign enjoyed resurrection in later years and in 1871, it was restored by Sir Charles Fremantle, the deputy minister of the Mint at the time. Sir Charles used a design by Benedetto Pistrucci, the Italian designer who passed away in 1855, known as the George and the dragon. The design was approved by the Queen and was used to strike sovereigns from 1871 to 1874 in Britain. The sovereign featured the head of the reigning monarch. In 1910, after the death of Edward VII necessitated a new obverse of his son, King George V, the design of which was created by designer Bertram Mackennal. This version of the sovereign continued to feature Pistrucci’s design of St George and the dragon on the reverse. It had a nominal value of one pound and is now considered to be a valuable bullion coin that is bought by investors, as well as numismatists as a collector’s item. George V gold sovereigns are available from Physical gold from as little as £260. The tradition of the sovereigns was of course preceded by King George V’s father, King Edward VII. Edward was the eldest son of Queen Victoria, who was often referred to as the greatest British monarch. He acceded to the throne upon his mother’s death in 1901 at the age of 60. The sovereigns issued upon the monarch’s accession to the throne commenced in 1902. These coins featured an obverse designed by George William De Saulles. These gold coins were issued until his death in 1910. You can purchase these for your collection from Physical Gold. Three sovereigns were issued during the reign of Queen Victoria. These coins featured a ‘young head’, ‘jubilee head’ and an ‘old head’ on the obverse. Of course, the ‘old head’ was coined during the later years of the reign of the Queen. The ‘young head’ coins display the Queen in a youthful look. Interestingly, there are two types of obverse sides for these coins. The St. George and dragon is one of the popular issues for the obverse side, however, a rarer and more valuable obverse features a shield back design. Queen Victoria sovereigns were struck at mintage quantities of more than 16mn by 1872. The coins you purchase from Physical Gold will most likely have the St. George and dragon motif on the obverse and would date between 1871 and 1887, but we do sometimes get lucky with the odd Victoria shield back Sovereign. The Gold Britannia is a bullion coin produced by the Royal Mint. The Britannia 1oz coin was initially launched in 1987. Since then, 2017 marked 30 years of the iconic coin, that has seen several issues, year on year. It is interesting to note that there are very few pre-owned Britannias on the market, which means that investors who buy them, prefer to hold them for a long time as an investment. The famous image of Britannia on the coin represents a tradition that has lasted for centuries. The coin is capital gains tax-free, which is an added impetus for those willing to invest in gold Britannias as a long-term investment of great value. Half sovereigns are an excellent buy, probably second only to the gold sovereign itself. Half sovereigns were issued as a part of the great British coinage with the obverse featuring different monarchs, during their respective reigns. These include Queen Elizabeth, the reigning monarch, as well as George V, Edward VII and Queen Victoria. Most of the coins available today are pre-owned and can be purchased from Physical Gold for as little as £127. The sovereign coins featuring the Queen Victoria Jubilee head were minted for only 7 years in limited numbers and are therefore lesser in number and rarer. These coins have mintmarks indicating that they were struck in mints across the erstwhile British empire, namely London, Melbourne, and Sydney. 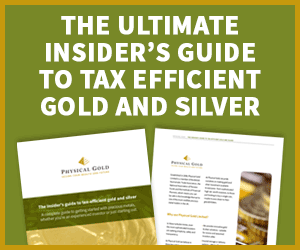 Select coins are available as tax free investment from Physical Gold. A popular theme of British coinage is to feature an image of St. George and the dragon on the obverse and the monarch’s head on the reverse. The angel is considered to be an iconic British gold coin, so famous at one time that the name was used to christen places and venues. The famous ‘Angel Inn’ in Islington, London is named after it, as is the Angel tube station in London. The coin was initially introduced by Edward IV in 1465. The obverse featured an image of the archangel Michael slaying a dragon, while the reverse shows a ship with arms, with sun rays at the masthead. The angel was continued as a part of British coinage through the reign of many monarchs, including Henry VIII, Elizabeth I, James I and Edward VI and had different values from 6 shillings to 11 shillings. Today it is a valuable and rare collector’s item. A gold angel from the reign of Elizabeth I is valued at £7,250 by Stanley Gibbons. Queen Elizabeth I had a substantial gold coinage, although much underrated by numismatists. The gold crowns issued during the Elizabethan era were meant for circulation only in 1601 and 1602. These coins are a great collector’s item today, as limited quantities were minted at the time. The obverse features the Queen’s head, while the reverse displays the royal coat of arms. Although a relatively new addition to British coinage history, the series has had a significant impact on buyers and is certainly worthy of mention. The royal mint introduced these in 2016 and the iconic coins form a series, with each coin featuring one of the ten queen’s beast statues that were displayed at the coronation of Queen Elizabeth II, the current reigning monarch. Lunar gold coins were issued by the royal mint from 2014. It is a series of bullion coins, with a new coin launched each year, featuring a Chinese zodiac animal associated with that particular lunar year. The entire series will be a 12 coin series and the ones already released feature the dog, monkey, sheep, horse, and rooster. You can view these and purchase the ones you love at Physical Gold. Interestingly, in 2014 it was reported that 38,000 coins had been mistakenly struck with the obverse intended for the gold Britannia. These coins would eventually become a rarity and a collector’s item due to the error. If you’re thinking of investing in British gold coins as an investor or a numismatist, look no further. Our team at Physical Gold has both gold investment experts as well as numismatics experts. Call us now on 020 7060 9992 or contact us via our website for guidance on buying gold coins.